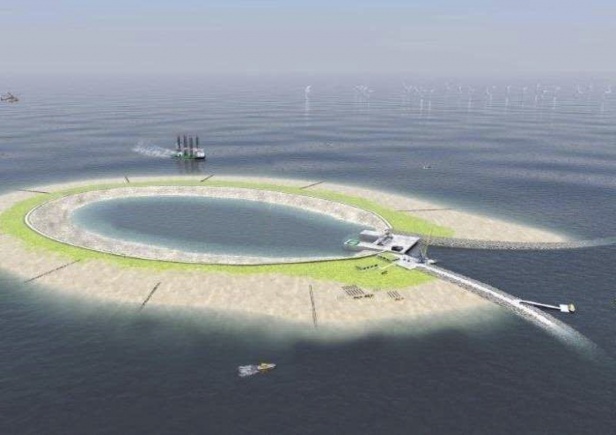 Belgian cabinet member, Johan Vande Lanotte, has introduced a planning proposal for a man-made atoll placed in the North Sea to store energy. The idea is to place the island a few kilometers off shore near a wind farm, according to Vande Lanotte’s office. When the wind farm produces excess energy for the local electricity grid, such as off-peak times in the overnight hours, the island will store the energy and release it later during peak times. It would use the oldest and most cost-effective bulk energy storage there is: pumped hydro. During off-peak times, power from the turbines would pump water up 15 meters to a reservoir. To generate electricity during peak times, the water is released to turn a generator, according to a representative. The Belgian government doesn’t propose building the facility itself and would rely on private industry instead. Hat tip to Bill Gates.